Bells Beach - Big Easter Sunday 1965 is a short video which features an interview with Torquay surfer/photographer Barrie Sutherland describing the huge surf at the 1965 Bells Beach Surfing Contest. The video also features a number of photographs by Barrie Sutherland taken on Easter Sunday 1965. Duration: 03.28 Available as an MP4 Video. On Easter Sunday 1965 competitors in the Bells Beach Surfing Contest were greeted with the sight of 15-18 foot waves marching into Bells Beach. Riding 9-10 foot boards with no legropes the bravery of many surfers was challenged on this day. A day when reputations were made. 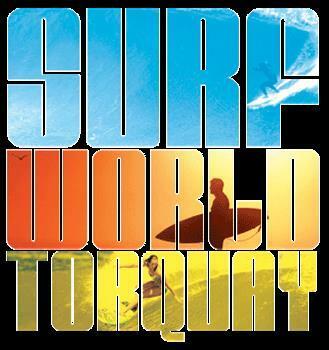 Easter Sunday 1965 went down in Australian surfing history as the day when the largest waves were ridden in a surf contest outside of Hawaii. It was a significant day in establishing the reputation of Bells Beach as a big wave surfing location. 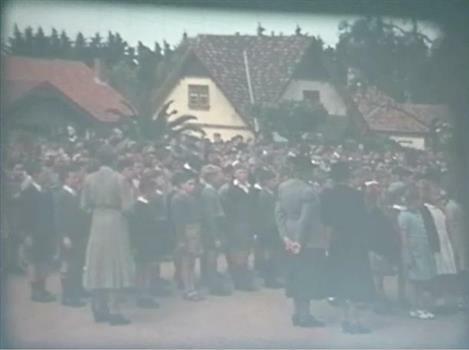 16mm film of schoolyard activities. Used by the Malvern city council until 1969 to drive a rock crushing plant. 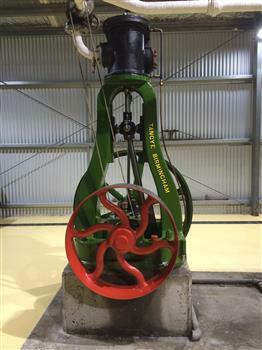 While large horizontal steam engines predominated in major factories, small vertical steam engines like this were the workhorses of industries that had modest power requirements. This reliable little engine, made by leading UK manufacturer Tangye Bros of Birmingham Steam engines had the advantage that any fuel could be used to fire their boilers, but they were less convenient and efficient than internal combustion engines, required operators with higher skill levels, and had lower power to weight ratios. Tangye Limited was founded in 1857 in Birmingham by businessman Richard Tangye (1833-1906) and his mechanic brothers James and Joseph; brothers Edward and George joined them later. Richard was born near Redruth in Cornwall and educated at the Friends School at Sidcot, Somerset, where he became a pupil-teacher. From there he moved to Birmingham to work as a clerk for an engineering firm. In 1856 he started a hardware factor and commission agent business in Birmingham whose customers were mainly Cornish mine-owners in the Redruth district. From 1858 Tangyes concentrated on the manufacture of machinery and secured the sole right to manufacture Weston's differential pulley block (object 2003/45/1). They established their Cornwall Works in the Birmingham suburb of Smethwick in 1864 and soon developed a huge range of products. It was stated that 'there are perhaps no other works in the kingdom so largely employed upon so great a variety of specialities as the Cornwall Works of Messrs Tangye Bros.' The Tangyes attracted creative people to work for them. They wrote: 'We are in a position to offer unusual facilities to Inventors for carrying out their patents.' 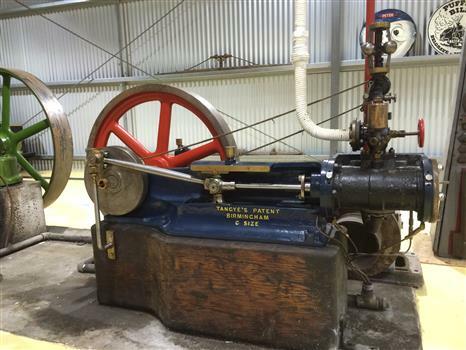 Info about Tangye Bros of Birmingham from Powerhouse Museum https://ma.as/207954 Donated by Malvern City Council in 1969 Of Interest : The Vertical and Horizontal Tangye engines on display are of the design that won a Gold Medallion at the Paris Industrial Exhibition of 1878. Builders Number 4767 Used for steam engine driving instruction at the Royal Melbourne Institute of Technology build date of approximately 1884 +/- 1 year. worked out from http://www.internationalsteam.co.uk/mills/burmamill22.htm Donated by The Royal Melbourne Institute of technology in 1969 Of Interest : The Vertical and Horizontal Tangye engines on display are of the design that won a Gold Medallion at the Paris Industrial Exhibition of 1878. 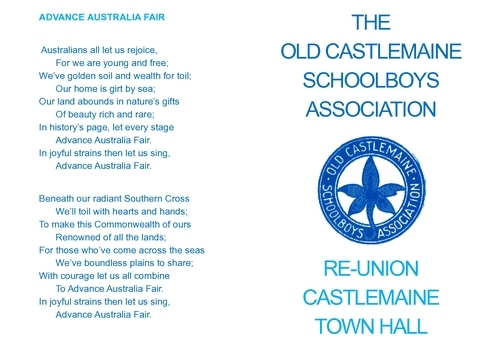 Published on May 9, 2017 Visit the magical historic town of Maldon, declared Australia's first notable town by the National Trust of Australia. Home to remarkable shops and bustling with events throughout the year, Maldon retains an old world feel that was imprinted in Victoria's Gold Rush. Drone footage courtesy of Graham Hosking. With thanks to: Mount Alexander Shire Maldon Inc. Mr. Peter Thompson Maldon Twilight Dinner Maldon Brass Band Maldon Easter Fair and the wonderful people of Maldon. Report on the need for more Seeing Eye Dog sponsors upon the anniversary of 50 years of seeing eye dogs in Australia. It includes interviews with Jacky Tupangaia, Nick Gleeson and Gerard Menses. With an estimated 600,000 vision impaired people by 2020, the target of 5000 new puppy sponsors are required to help Vision Australia meet demand. 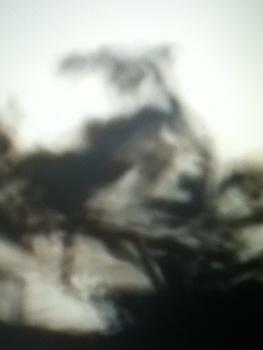 Moving image from inside the Baptistry at Pisa. 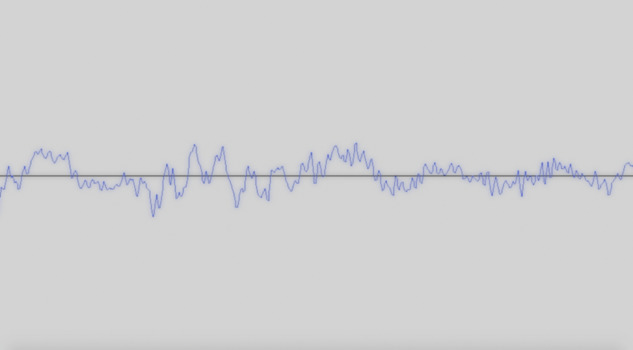 Known for its amazing accoustics, the sound in this image is one person singing a couple of notes. Links: 05225:04705 Digital video recording. MP4. 2 min 32 sec. An interview with Bonnie Dickson and Russell Dickson about their memories of the Greensborough Football Club as the Dickson family (including the late Ray Dickson) is inducted into the Club's Hall of Fame as Members. In 2016, the Greensborough Football Club inducted a number of their past players into the Hall of Fame. These recordings were made for the Hall of Fame Presentation. Links: 05226:04705 Digital video recording. MP4. 2 min 06 sec. Links: 05227:04705 Digital video recording. MP4. 1 min 15 sec. Links: 05231:04705 Digital video recording. MP4. 1 min 54 sec. Links: 05228:04705 Digital video recording. MP4. 2 min 44 sec. 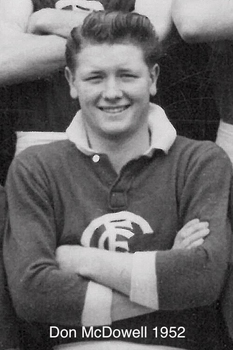 An interview with Gary Partington about his memories of the Greensborough Football Club as the Partington family (including the late Alan Partington) is inducted into the Club's Hall of Fame as Members. Links: 05229:04705 Digital video recording. MP4. 1 min 23 sec. 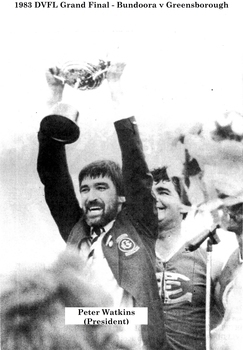 An interview with Glenn Meredith about his memories of the Greensborough Football Club as he is inducted into the Club's Hall of Fame as a Member. Links: 05230:04705 Digital video recording. MP4. 2 min 42 sec. 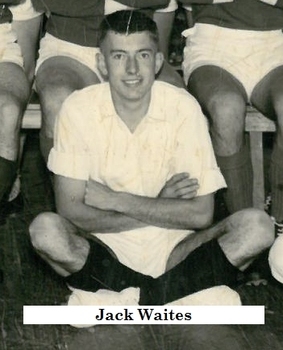 An interview with Jack Waites about his memories of the Greensborough Football Club as he is inducted into the Club's Hall of Fame as a Member. Links: 05232:04705 Digital video recording. MP4. 2 min 30 sec. 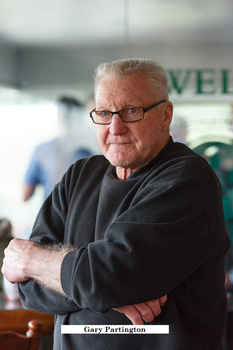 An interview with Neil Brindley about his memories of the Greensborough Football Club as he is inducted into the Club's Hall of Fame as a Member. Links: 05233:04705 Digital video recording. MP4. 1 min 48 sec. 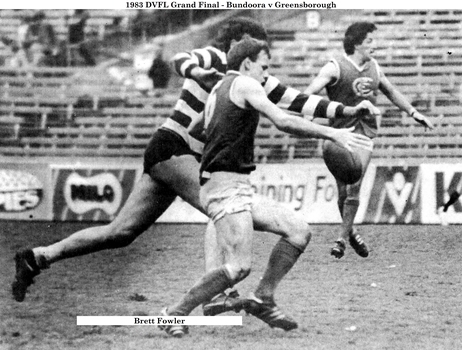 An interview with Peter Banks about his memories of the Greensborough Football Club as he is inducted into the Club's Hall of Fame as a Member. Links: 05234:04705 Digital video recording. MP4. 2 min 01 sec. An interview with Peter Watkins about his memories of the Greensborough Football Club as he is inducted into the Club's Hall of Fame as a Member. Links: 05235:04705 Digital video recording. MP4. 2 min 18 sec. 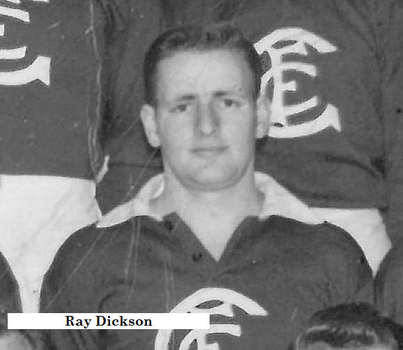 An interview with Robert Hyde about his memories of the Greensborough Football Club as he is inducted into the Club's Hall of Fame as a Member. CD-ROM with MP4 file showing E.J. (Jack) Barker (former Ballarat School of Mines Pincipal, inaugural Director of Ballarat Institue of Advanced Education) on the history of the institution. The file needs editing to the mention of the Carmel Committee. South West should replace South East.